Key Message: DBS is a well-established treatment for various movement disorders. It is essential to properly select patients to get desirable results. Adhering to a proper surgical technique is important to achieve desirable surgical results. Deep brain stimulation (DBS) is performed commonly for Parkinson's disease and dystonias.,,,, Some other prominent indications include tremors, epilepsy, and obsessive compulsive disorders.,,,,, Deep brain stimulation surgery is one of the most precise and labour intensive neurosurgical procedures, the outcome of which is either success or failure depending upon the target localisation and execution of the procedure. Many DBS failures are, in fact, due to poor patient selection. The single most important predictor of a good postoperative outcome is the patient's response to levodopa therapy. The response is defined as more than 30% improvement in the motor section of unified Parkinson's disease rating scale (UPDRS) as compared to the off period. Cognitive decline and dementia are strict contraindications for the DBS procedure. The minimum duration of symptoms of 4-5 years is considered as one of the important selection criteria for the DBS procedure in a patient with well established diagnosis of PD. DBS should only be opted for when the motor symptoms are severe enough to cause significant disability. Though there are no studies which give a specific score of UPDRS beyond which surgery is advised, the severity in most of the surgical patients corresponds to an off period motor score of around 40. The dystonias are broadly classified into the primary and secondary types. Patients who respond well to DBS are those with an early onset primary hereditary type of dystonia, who are positive for the DYT-1 gene.,, Two important factors which decide the optimal response to DBS are the younger age of the patient and a shorter duration of the disease. Dystonias involving the trunk and proximal part of the limbs respond better to DBS than those involving neck and distal limbs (like the writer's cramp). Though patients with secondary dystonias are generally considered as poor candidates for DBS, a few conditions like tardive dystonias due to anti-psychiatric medications, and metabolic conditions like Lesch-Nyhan syndrome respond better to DBS. Hence, it is important to evaluate all these factors and counsel the patients regarding their expectations from the DBS procedure based on their disease profile. Like other movements disorders, not all patients with tremors will respond well to DBS. The patients who respond well are those with resting tremors involving the distal part of their upper limbs. In patients with action tremors, as well as those with involvement of lower limbs, especially the proximal region, the response to DBS procedure is sub-optimal. Apart from the patient selection for DBS, it is equally important to evaluate surgical fitness of patients and optimise the co-morbid conditions like hypertension, diabetes, and hypothyroidism, before surgery is undertaken. More importantly, the blood pressure has to be strictly optimised before surgery, as a high blood pressure is a known risk factor for the development of a postoperative intracranial haemorrhage (ICH) following a DBS procedure. The risk of developing an ICH in hypertensive Parkinsonism patients is 2.5 times more than in normotensive patients. Stereotactic frame fixation and DBS lead implantation are preferably done under local anaesthesia. This facilitates the intraoperative clinical evaluation of patients for obtaining the optimal response and for avoiding any procedural side effects. 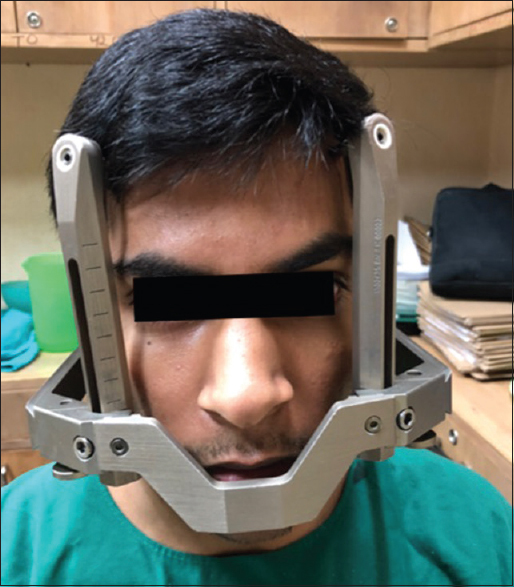 Sometimes, patients with PD with a significant head movement, patients with generalised dystonia, or uncooperative patients, encounter difficulty during the frame fixation; therefore, they may need general anaesthesia for the entire procedure. Foreseeing this issue would make the workflow more efficient. Another important requirement in PD patients is to withhold all anti-parkinsonism medications after the previous night's dose to unmask the severity of the disease, which also facilitates a proper intraoperative evaluation of the microelectrode recording (MER) and prevents an intraoperative dyskinesia from developing. This helps in the proper target localisation and in improving the accuracy of lead placement. A thorough counselling is an integral part of the DBS procedure. This should educate the patient about all the realistic expectations that are likely to be met with after surgery with respect to the response obtained and the improvement in the disability status. Counselling should also include a focus on the chances of treatment failure due to hardware breakdown or the target localization issues. The DBS procedure is an unusual procedure for these debilitated patients, which is mostly done in the awake condition after frame fixation. The whole procedure needs the full cooperation of patients during their surgery. The patients should be thoroughly briefed about the procedure and what is expected from them during the actual conduction of the procedure. It is very important for patients and their caretakers to understand that the DBS procedure will not achieve a cure but only serves as a disease modifier, which invariably requires adjustment of electrical parameters on a regular basis. Slice thickness of 1.0mm (T1, T2, inversion recovery [IR]). The field of view (FOV) must encompass the entire region of interest, the anterior commissure/posterior commissure (AC/PC) structures, the target region, the entry region and the stereotactic frame fiducials. The size of the FOV is typically kept between 24-28 cm. T1 axial hard palate- to-top of the head sections with double dose of contrast to visualise all blood vessels in the sulci and the striatum. The T1 scan comprises three-dimensional (3D) volume acquisitions (the MPRAGE- magnetization prepared rapid acquisition gradient echo sequence) with cubical voxels reformatted in the axial plain. The advantage of a 3D scan is that these images can be reconstructed with similar quality in any plane, on the planning station. The T1 parameters include TR 15, TE 5, flip angle 15, signal excitations 1-2, bandwidth 130Hz/pixel. The T2 axial as well as coronal scans should include at least 30 slices of 1 mm thickness in the region of the basal ganglia for the purpose of direct visualization of basal ganglia targets. T2 parameters include TR 3500, TE 108, NE × 4 + to give an adequate signal-to-noise ratio (SNR), and a bandwidth of 195 Hz/pixel. After acquisition, all images are transferred to the planning system in the digital imaging and communications in medicine (DICOM) format. 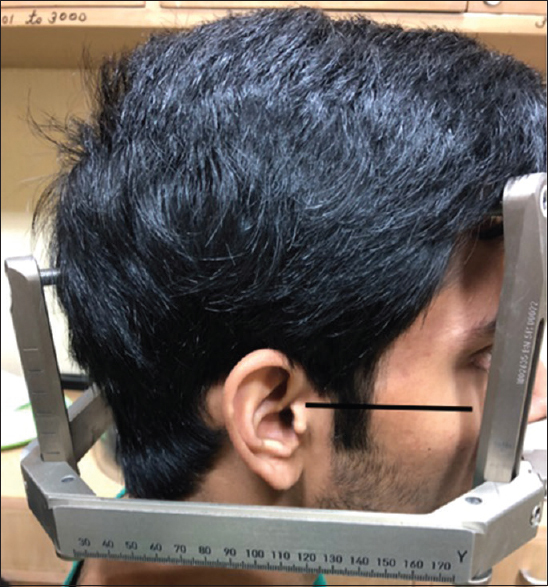 The principle of using any stereotactic frame is to create a stereotactic space around the patient's head in order to deduce coordinates (based on the Cartesian system), which in turn are used during surgery to reach any target inside the cranium. The typical components of a stereotactic frame include the frame base, ear plugs, ear plug holders, fixation posts and fixation screws. Two anterior posts, which are fixed over the forehead, are longer than the two shorter, posterior occipital posts. We prefer clipping hair of whole of the head before the frame fixation. The frame fixation is done while the patient is sitting comfortably on a chair, unless the person is anaesthetised. 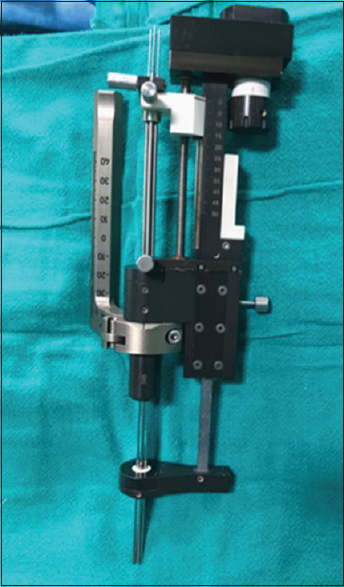 The frame based stereotactic apparatus needs to be assembled with the four fixation posts and two ear bars. 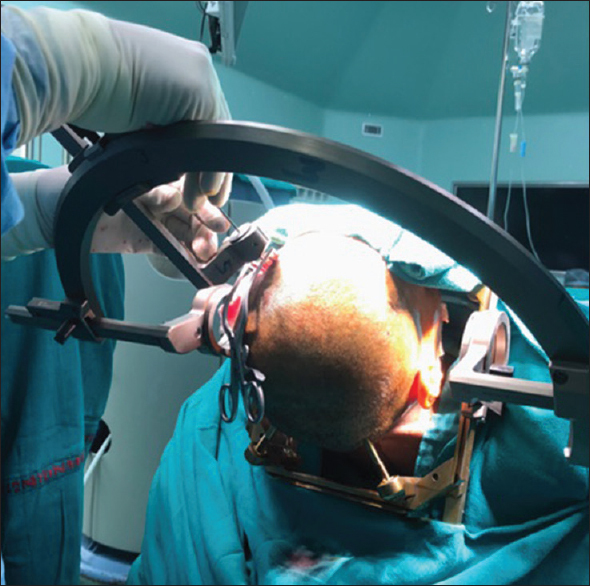 While placing the stereotactic frame on the patient's head, the frame base has to be kept aligned along the orbito-meatal plane [Figure 1]. This will, in turn, keep the frame base parallel to the AC-PC line. The patient should be explained well about the anticipated discomfort or pain in the external auditory meatus when these ear plugs are inserted there. A cotton plug soaked in lignocaine may be kept in the external auditory meatus for a while to prevent pain or the vasovagal reflex. While the ear plugs are in situ, the stereotactic frame is centred along the skull [Figure 2]. 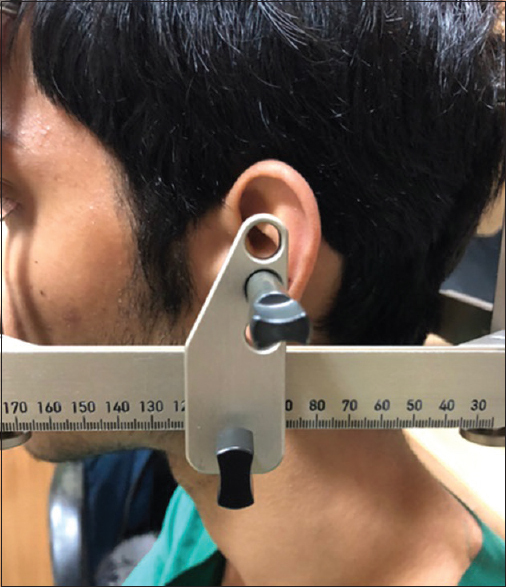 The ear bars help in preventing the frame motion in 2 different axes, known as the yaw motion (motion along the axial plane) and the rolling motion (motion along the coronal plane). It should be ensured that the head is in the centre of the stereotactic frame [Figure 3]. A local anaesthetic agent is infiltrated on the scalp to raise a weal by passing the needle through the apertures in the post. During the procedure, the length required for the screw insertion can also be measured. The screws should neither be too long (which can hamper the placement of the co-ordinator box), nor be too short (which can compromise the stability of the frame). Screws are tightened diagonally across at a given time. The patient should be monitored for possible vasovagal syncope while fixing the frame. After the frame fixation, ear plugs and their holders are removed and the patient is shifted for undergoing a stereotactic computed tomographic (CT) scan. The CT image acquisition is done after the stereotactic frame fixation. The patient is shifted on the CT couch and the stereotactic frame is positioned on the frame adapter, which is fixed to the CT table. The next step is the placement of a fiducial indicator box or co-ordinator box on the stereotactic frame. There are laser marker lines on the coordinator box on the front as well as both side plates. 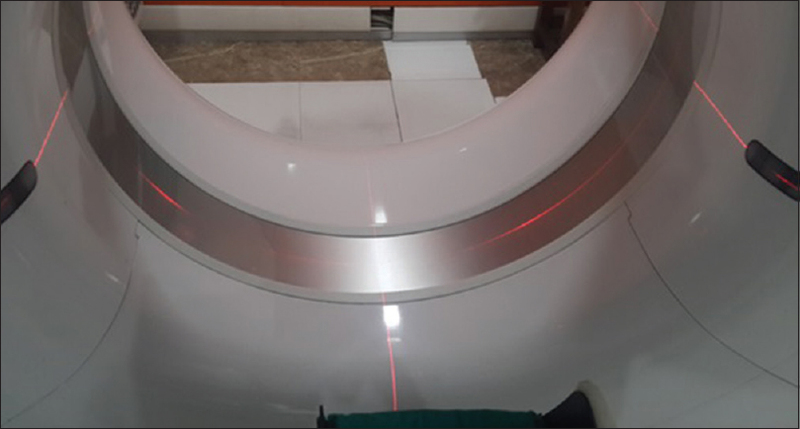 The coordinator box markings are aligned along the CT gantry laser lights [Figure 4]. 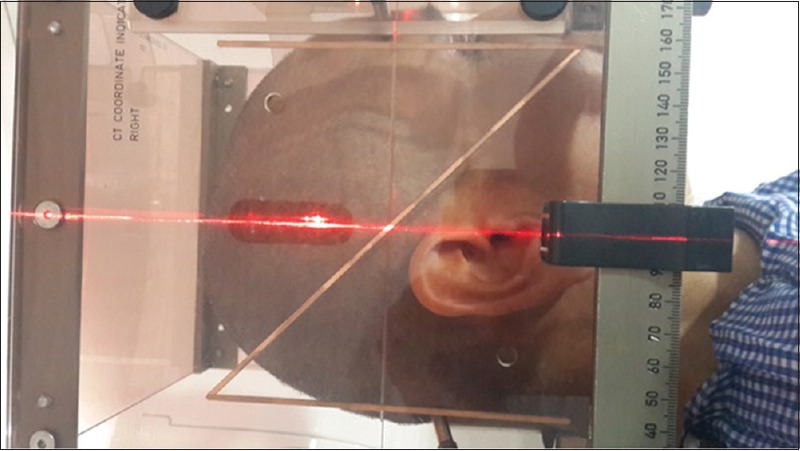 Laser alignments [Figure 5] and [Figure 6] can be done with the help of the table adapter, which has 'Twist' and 'Tilt' adjustments for sagittal and coronal movements, respectively. There should not be any CT gantry tilt. Once the patient's head is aligned well with the frame system, a CT scan is acquired with a slice thickness of 1mm, contiguous with no overlap (zero angle, FOV 240, square matrices of 256 × 256). Once the images are acquired we should verify whether all the fiducials are seen and aligned in relation to one another. The acquired images are then transferred into the planning system in the DICOM format. The planning is done in the operative room after importing both the non-stereotactic MRI and the stereotactic CT images to a planning workstation. The CT images are marked as the registered series, as these are stereotactic images with the head frame on. Now the stereotactic CT images are fused with the non-stereotactic MRI images on a split screen, and it is ensured that each sulcus and other intracranial landmarks on both the images are overlapping perfectly. There can be many reasons for failure to achieve a good fusion like an improper frame fixation, a poor laser light alignment while acquiring CT images, a CT gantry tilt, an improper acquisition of CT and MRI images, or a deviation from the imaging protocols. These factors significantly affect the accuracy of planning and surgical outcome. During the planning, we need to define intracranial targets, the entry point on the skull and the trajectory through the brain. The trajectory should be planned in such a way that it should not pass though any sulcus or a ventricle, and should avoid any blood vessels that may come in the way. 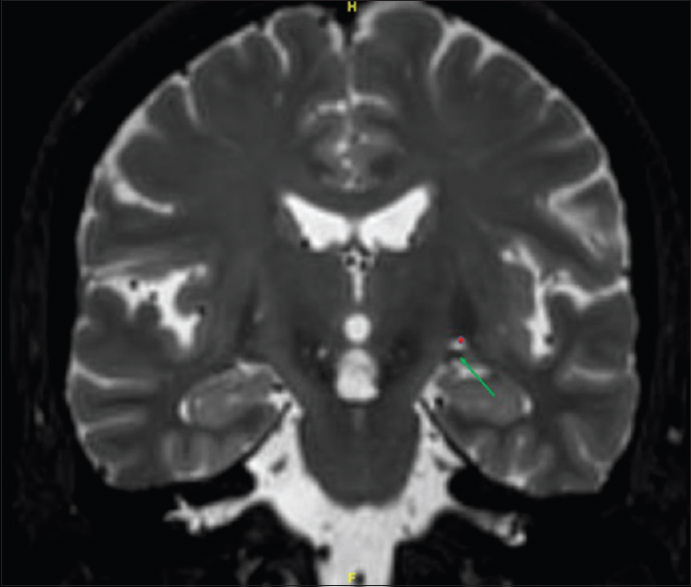 The planning for deep nuclei involves two kinds of targeting, one is atlas based indirect targeting using the AC-PC line as a reference [Figure 7] and [Figure 8]; and, the other is the direct targeting where a target is directly visualised and located on an MRI image and marked. 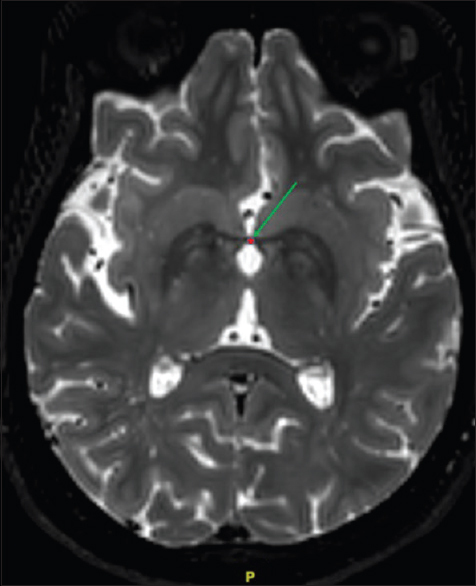 In modern imaging modalities, direct targeting is always possible and is more accurate. The indirect targeting begins with the acquiring of internal reference landmarks on the T2 weighted (W) MRI sequence. Anterior and posterior commissures are marked as internal landmarks, while a third landmark is taken at the aqueduct or any other midline structure for sagittal alignment. After these landmarks are acquired, indirect target planning can be done with the help of the inbuilt Schaltenbrand-Wahren atlas. Vim: 13 to 15 mm lateral and 5 mm posterior from the mid-commissural point and at the level of the AC/PC line. The nuclei are visualized directly with their anatomical landmarks. The basal ganglia nuclei and the grey matter in the upper midbrain are very well seen as hypointense areas on T2W MRI sequence. Red nucleus, subthalamic nucleus, substantia nigra, putamen, globus pallidus, optic tracts and other critical neural structures are very well seen on a 3 Tesla MRI scan. 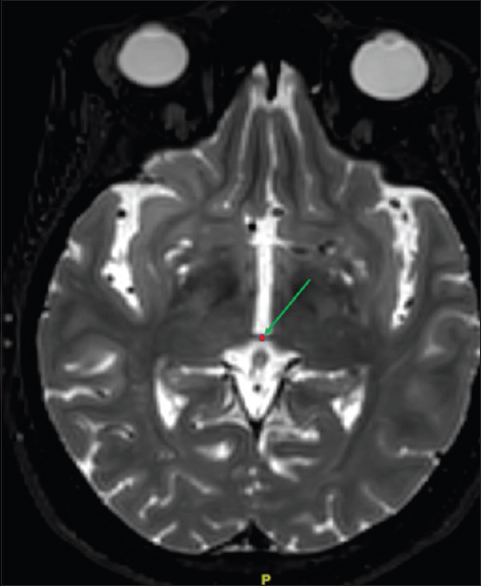 For STN, Bejjani et al., reported the use of red nucleus in localising the STN target. At the MRI section, where we find the maximum bulk of the red nucleus, two tangents are drawn on the anterior and lateral border of the red nucleus. From the antero-lateral point where these tangents intersect, the STN target lies 3 mm lateral to this point. Alternatively, the STN can be divided into the anterior 1/3 and posterior 2/3 areas. The STN target lies just proximal to this junction [Figure 10]. The VIM target is localised indirectly by using co-ordinates mentioned earlier, as the lateral border of the thalamus is difficult to differentiate from the medial border of the internal capsule. The trajectory has a mediolateral angle of around 15 degrees from the sagittal plane and the anterior angle of 60 degrees to AC/PC plane for accessing the STN. For the GPi trajectory, the mediolateral angle is 0-5 degrees from the sagittal plane and the anterior angle is 60 degrees to the AC/PC plane. With these angles, the entry point is selected on the skull and the trajectory should be planned in such a way that it is extra-ventricular and completely intra-parenchymal without passing through any sulcal spaces, thus avoiding any vascular structures. The workstation provides the details of the target as coordinates labelled as X, Y and Z. The workstation also provides the entry point coordinates as arc and ring values on the stereotactic arc. The patient with the stereotactic frame in situ (in the present description, the Leksell frame [Electa, Stolkhlom] was used) is positioned supine on the operating table. The head frame is coupled to an adaptor fixed onto the Mayfield base that is attached to the operating table. The head end of the table is elevated around 30 degrees. Lead placement is usually done under local anaesthesia, unless contraindicated. Oxygen is delivered to the patient through nasal prongs and all pressure points are checked after the final positioning. 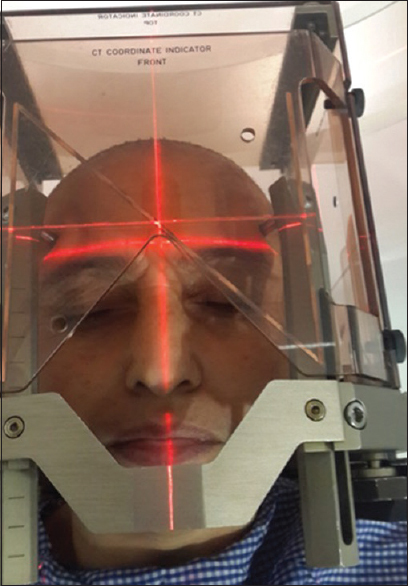 A C-arm image intensifier is positioned around the patient's head. The entire head of the patient and the stereotactic frame are cleaned with 10% povidone iodine. Draping is done in such a manner that the patient's face and limbs are accessible for a clinical examination. Now, the stereotactic arc is fixed on the head frame. 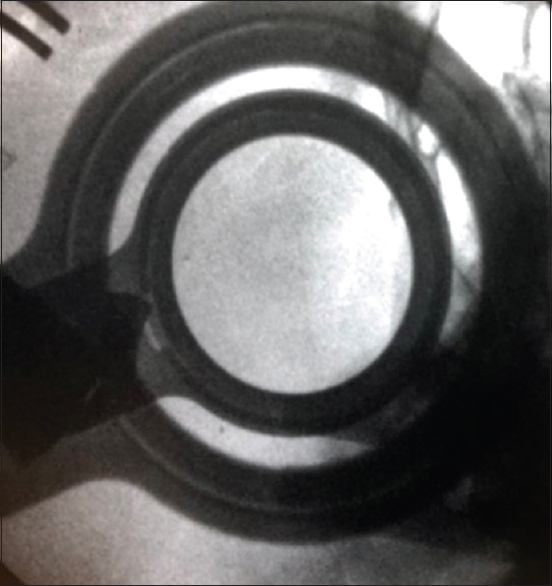 The C-arm image intensifier is positioned in such a way that the X-ray image shows the two side rings of stereotactic arc overlapping with one another and appearing as two concentric rings [Figure 11]. Following this, the X-Y-Z coordinates values are set on the stereotactic frame. All settings must be rechecked and confirmed by at least two other team members. Now, the arc and ring values of the stereotactic arc are set to locate the entry point [Figure 12]. 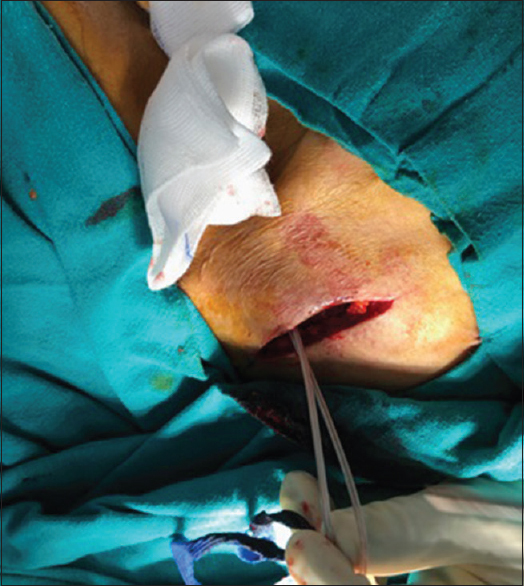 After infiltration with lignocaine, around 3 cm incision is given at the entry point and is opened with a small self-retaining retractor. The desired entry point is re-marked on the skull bone, using the same co-ordinates, with a marker. The burr hole is made with a disposable perforator of 14mm size. 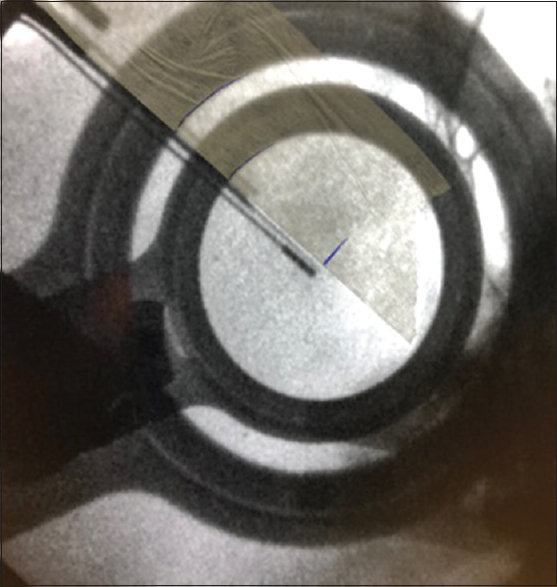 Over this 14 mm burr hole, a self retaining plastic ring is placed [Figure 13] for fixing the implanted DBS lead. Now the microdrive [Figure 14] is assembled and mounted onto the stereotactic arc [Figure 15]. The dura is incised and is coagulated. The underlying cortex is also coagulated and a small cortisectomy is performed. The microdrive with its mounted five electrodes are moved into the brain. 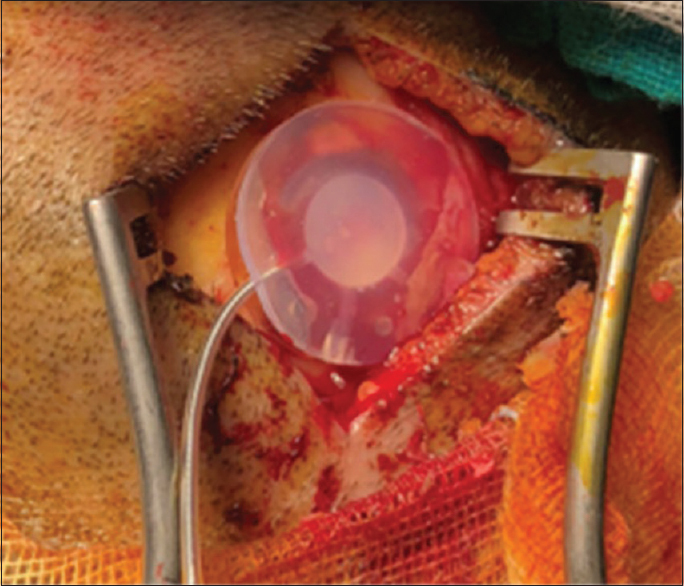 The dural hole is also sealed with fibrin glue to prevent CSF leakage. The electrodes mounted on the microdrive are moved forward towards the target, millimetre by millimetre. The Medtronic microdrive system used at our department has graduations upto 0.1mm. The marking of 40mm on the microdrive indicates the target. 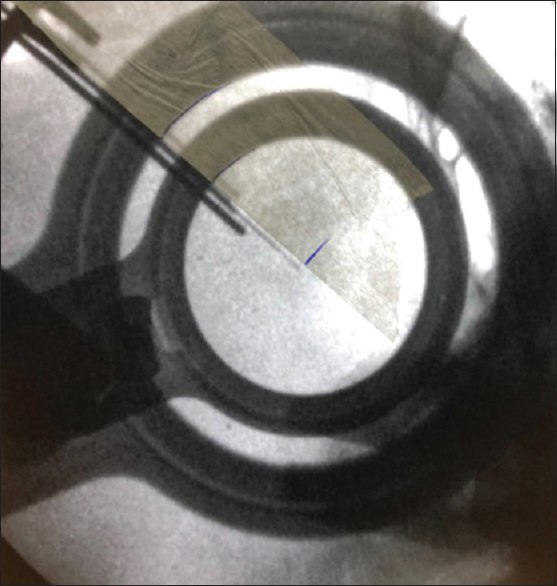 As the electrodes move deeper towards the target, microelectrode recording (MER) is continuously done to look for the target. Once the target is localised precisely with the help of MER recording, each electrode is stimulated to look for the best motor response in the form of reduction of rigidity, ease of performing the motor activity and the clarity of speech. Any side effect in the form of dystonia, hemiparesis, visual symptoms or dyskinesia are also noted. Once the final target is decided based on the MER recording and the stimulation response, that particular electrode is taken out. A dilator is passed along that track to facilitate a quadripolar lead insertion into the target position. Other electrodes will act as reference electrodes [Figure 16] and the DBS lead is taken up to that level [Figure 17]. Once the quadripolar DBS lead is at its destination, it is temporarily hitched on to the slit of the burr hole ring. All other recording electrodes are taken out and now the DBS lead is firmly fixed with a silicon cap over the burr hole ring. [Figure 18]. Then the extra length of the lead wire is carefully coiled under the scalp around the burr hole ring to prevent an accidental pull-out during the remaining part of the surgery. A similar procedure is done on the other side. The connection ends of both the leads are brought to the left-sided operative incision though the subgaleal space. These leads are temporarily kept in the subgaleal pouch on the left side. The right sided scalp incision is closed in two layers while the left sided scalp incision is temporarily closed with 3.0 nylon interrupted sutures. 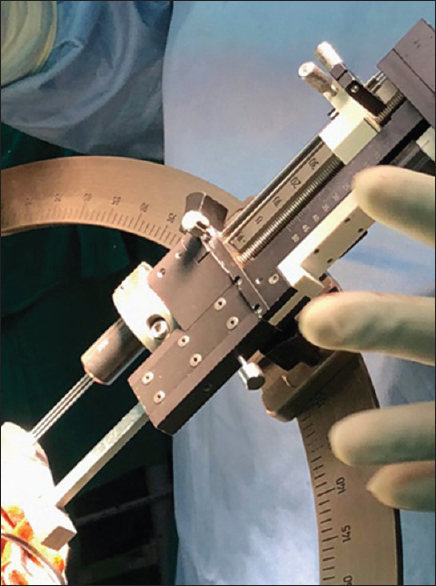 The stereotactic frame can now be removed after the confirmation of the final lead positioning on the intraoperative C-arm X ray image intensifier. This part of the surgery involves creation of an infraclavicular subcutaneous pouch for IPG placement and tunneling for the extension wires. This procedure needs general anesthesia. The patient is positioned supine with the head turned towards the right side, as is done for a ventriculoperitoneal shunt surgery. The surgical field is cleaned and draped properly. A transverse incision of about 6-8 cm is made 4-5 cm below the clavicle in the left infraclavicular region. A plane above the pectoral fascia is created and dissected inferiorly and superiorly from the level of incision. The thickness of this flap should be in the range of 1.5-3 cm. 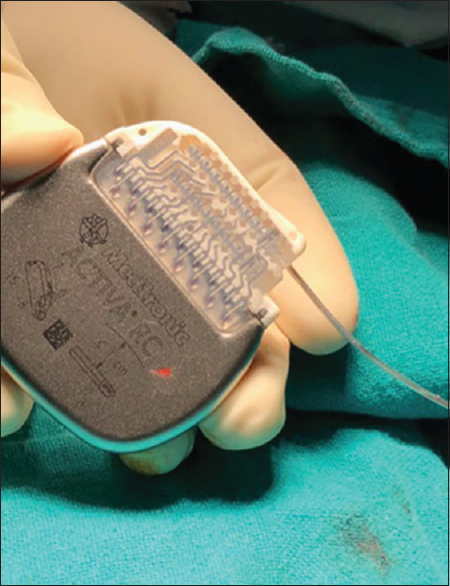 The thinner flap might lead to erosion of the skin over the implant, and a thicker flap might lead to problems in the programming and the remote charging of the IPG. The left burr hole site is now reopened. The DBS leads are taken out of the subgaleal pouch, and a subcutaneous tunnel is made from the burr hole site to the chest incision. The tunnel should pass behind the ipsilateral ear. A separate small incision might be required at the level of mastoid. A special tunnelling device is provided with grooves for two different lengths of extension wires, the longer for the right, and the shorter for the left extension wires. To mark the right or the left extension wire, we tie a ribbon on one of the extension wires at its distal end. The tunnelling device is inserted from above downwards and the extension wires are hooked on to the grooves of the tunnelling device and are pulled up into the left burr hole site. These extension wires are now attached to their respective DBS leads [Figure 20]a. Care should be taken to identify the side and alignment of the contact points before tightening the four set screws. The specially designed hex wrench is a torque wrench system, which gives a click after adequate tightening of the set screws [Figure 20]b. The DBS lead and the extension wire contact junctions are covered with specially designed silicon sheaths and tied at the ends with 4.0 silk sutures. 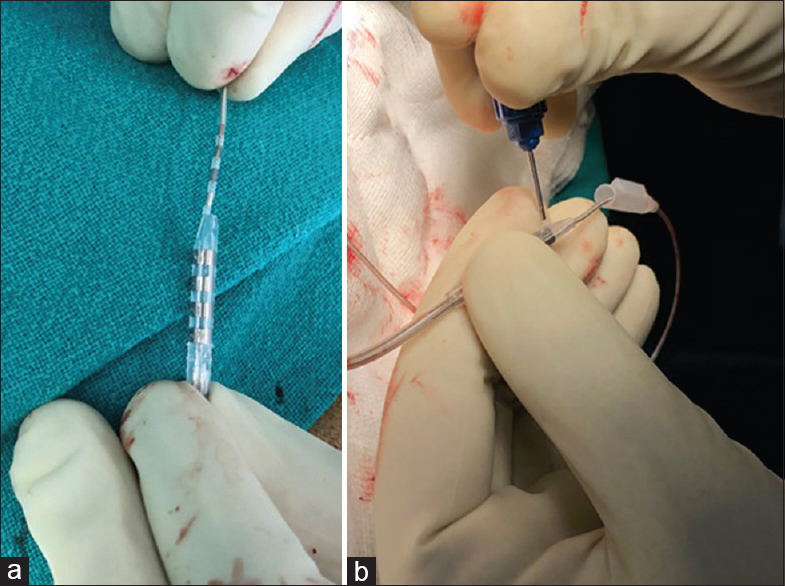 There should be a few strain-free loops of the leads in the subgaleal pouch and the subcutaneous pouch in chest to allow for movements of the head and neck. After connecting the DBS leads to the extension wires at the cranial end, the inferior end of the extension wires [Figure 19] are inserted into the IPG [Figure 21]. The right cable is inserted into the inferior connecting port of the IPG; and, the left cable is inserted into the superior port of the IPG. Screws should be tightened after making sure that all contact points are inserted and in position. Now, the IPG is switched on and the impedance of each side is checked (it should be within the range of 500 to 4000 Ω). 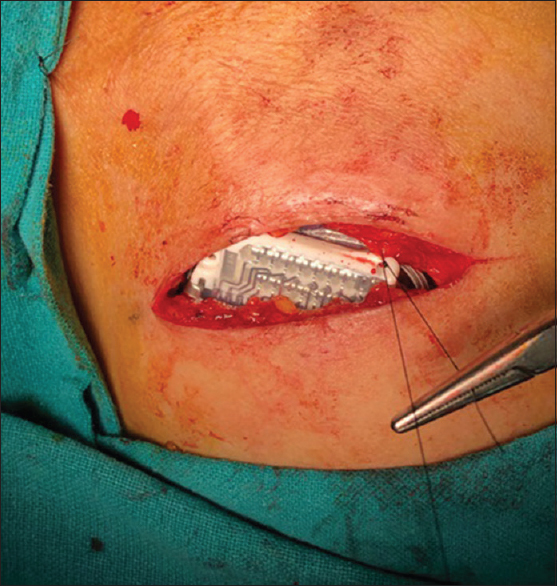 After checking the impedance, the IPG is switched off again and is inserted into the infraclavicular subcutaneous pocket [Figure 22] with an extra length of the extension cables coiled under the battery. Care should be taken that the extension wires should not come in the line of the incision. The battery is now fixed to the pectoral fascia with 2.0 nylon sutures and the wound is closed in layers. The DBS leads and the extension wires at the left burr hole site are coiled and placed in the subgaleal pocket in such a manner that these are away from the suture line. Thereafter, galea and skin are closed in layers at the left frontal incision also. The incision at the mastoid site is also closed in layers. Sterile dressing is applied, and the patient is extubated and shifted to the intensive care unit for observation. A CT scan under the DBS protocol can be done once the patient is stable. The CT scan images are merged with the MRI images to check for accuracy of the electrode placement. The programming is usually done after 2-3 days to allow for subsidence of microlesioning effect of the electrodes at the target site. Some specialists do it even after a week. The DBS programming is complex and may need several sittings before the final stimulating parameters are identified. Some of the early complications reported so far are the occurrence of a symptomatic haemorrhage (1%), an infarct (1%), a vasovagal response (0.8%), an electrode malposition and infection (1-2%). The delayed complications are related to the hardware, like discomfort (1.8%), lead breakage (1.4%), DBS lead migration (1.7%), fibrosis around the implant, IPG twisting/flipping or skin erosions. DBS for movement disorders is a well established surgical procedure. 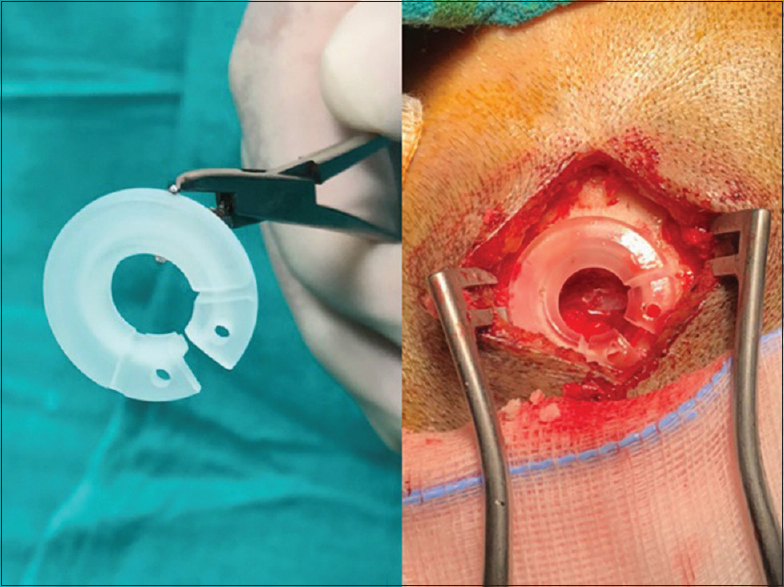 A systematic approach utilizing a well-defined methodology is essential to avoid an improper implant placement and its complications. Lang AE, Houeto JL, Krack P, Kubu C, Lyons KE, Moro E, et al. Deep brain stimulation: Preoperative issues. Mov Disord 2006;21 Suppl 14:S171-96. Pandey S, Sarma N. Deep brain stimulation: Current status. Neurol India 2015;63:9-18. Pandey S. When to do deep brain stimulation surgery in Parkinson disease? Early or late?. Neurol India 2016;64:8-9. Charles PD, Van Blercom N, Krack P, Lee SL, Xie J, Besson G, et al. 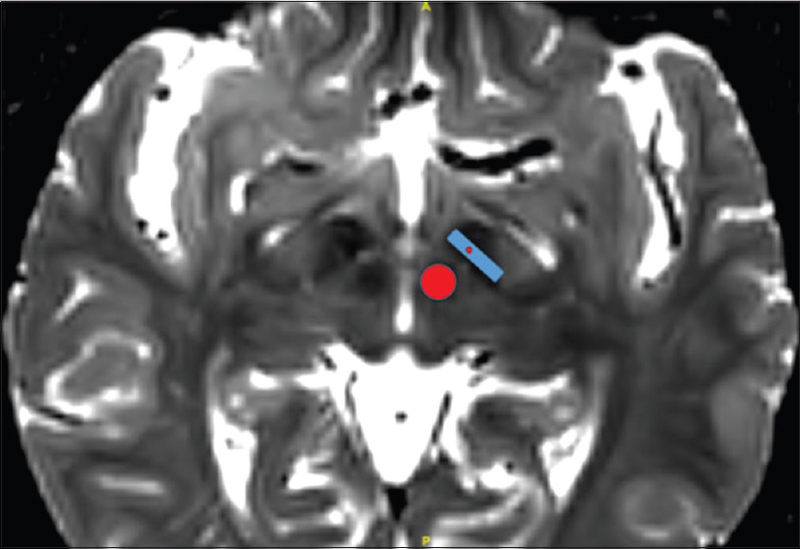 Predictors of effective bilateral subthalamic nucleus stimulation for Parkinson's disease. Neurology 2002;59:932-4. Panov F, Gologorsky Y, Connors G, Tagliati M, Miravite J, Alterman RL. Deep brain stimulation in DYT1 dystonia: A 10-year experience. Neurosurgery 2013;73:86-93. Yamada K, Hamasaki T, Hasegawa Y, Kuratsu J. Long disease duration interferes with therapeutic effect of globus pallidus internus pallidal stimulation in primary cervical dystonia. Neuromodulation 2013;16:219-25. Lozano AM. Vim thalamic stimulation for tremor. Arch Med Res 2000;31:266-9. Xiaowu H, Xiufeng J, Xiaoping Z, Bin H, Laixing W, Yiqun C, et al. Risks of intracranial hemorrhage in patients with Parkinson's disease receiving deep brain stimulation and ablation. Parkinsonism Relat Disord 2010;16:96-100. Bejjani BP, Dormont D, Pidoux B, Yelnik J, Damier P, Arnulf I, et al. Bilateral subthalamic stimulation for Parkinson's disease by using three-dimensional stereotactic magnetic resonance imaging and electrophysiological guidance. J Neurosurg 2000;92:615-25.